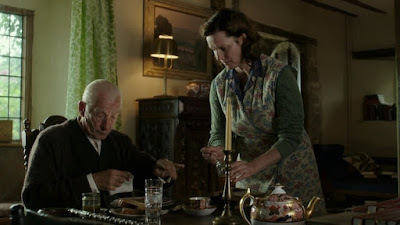 Meanwhile in 1947, the elderly and infirm detective is cared for by Mrs Munro (Laura Linney, with a slightly dodgy west country accent) and her son Roger, an inquisitive little boy with a taste for adventure and knowledge. Holmes attempts various ways to remember what happened with his final case and why his life is the way it is now. My Dad has that book. It's uncanny. That's all I can really tell you about the plot without giving anything away. Ian McKellen is astonishing and completely convincing as both a 60 year old and a man in his 90s. 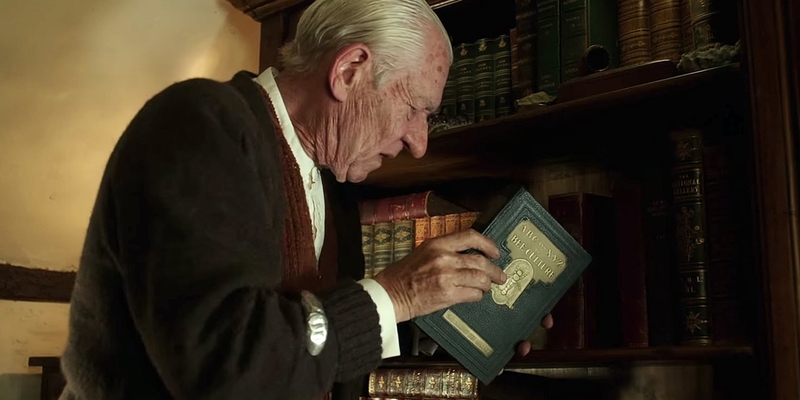 The way Sherlock Holmes is slipped into real life as a real person makes me revert to my child-self where I believed Sherlock Holmes was not fictional (I can still remember the day that my brother had to convince me otherwise. Worse than finding out about Father Christmas). The moment where Holmes goes to the cinema to watch Basil Rathbone (played by The Young Sherlock Holmes star Nicholas Rowe) play him solving the case he is struggling to remember, is wonderfully self-reflective. 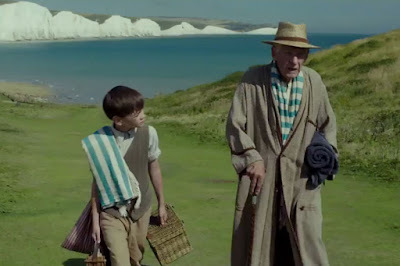 There are beautiful moments of cinematography where Holmes is satisfied about the order of things, reflected in the pattern of the cloisters and the repeating patterns in the park until it all goes wrong. There is a struggle in his mental health, reflected in the bees (order) and wasps (chaos), the bees perfect combs and twisted mass of the wasp nest. 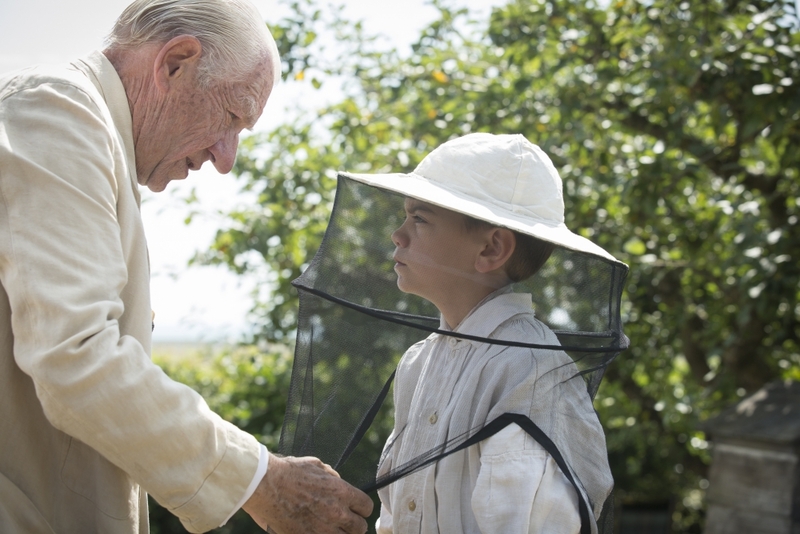 Will Sherlock and his bees triumph or will the wasps and their chaos overtake it all? As some of you will know I kept bees a few years back. 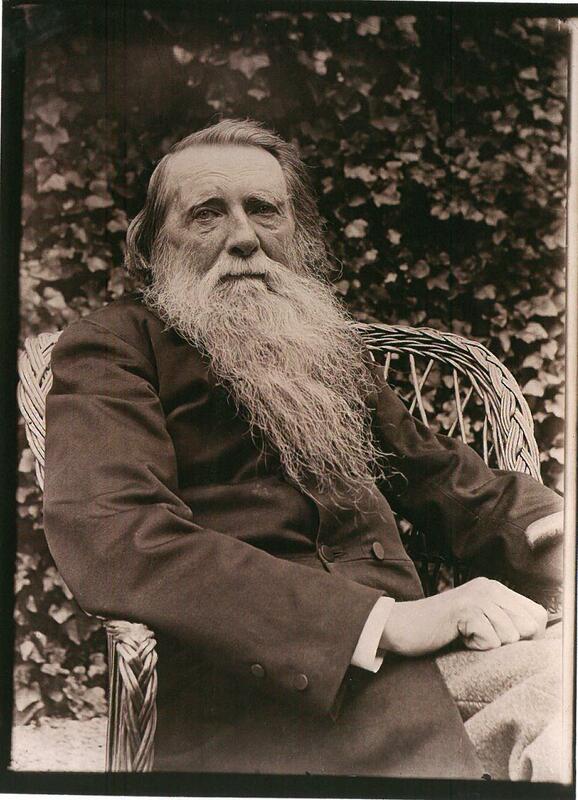 My Dad has kept bees for the last 200 years and so honey is in my blood and I appreciated the wonderful way the bees appeared, the way Holmes handled the combs and the gentle care he took of the colonies. The scene where Holmes lifted the combs with his bare hands reminds me of my Dad who is utterly fearless when it comes to the bees. 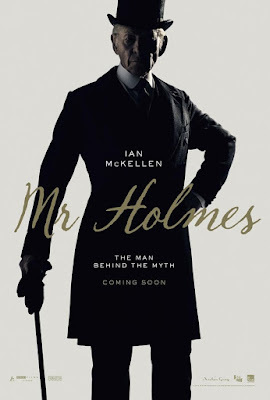 If you are hoping for a whodunit or an Arthur Conan Doyle mystery, you're out of luck because it isn't that sort of film. It's a story about memory, understanding and connection with others. It is packed with stars and filled with questions, not all of which are answered. There are some beautiful touches and lots of clues which you have to look out for, especially in the three different versions of the same story that Holmes is endeavouring to remember. What I took away from the film was the necessity of friendship, companionship, understanding and the beauty of order as we get older. When chaos comes, remember it's not the bees fault. And also, why would anyone want to live in Portsmouth? 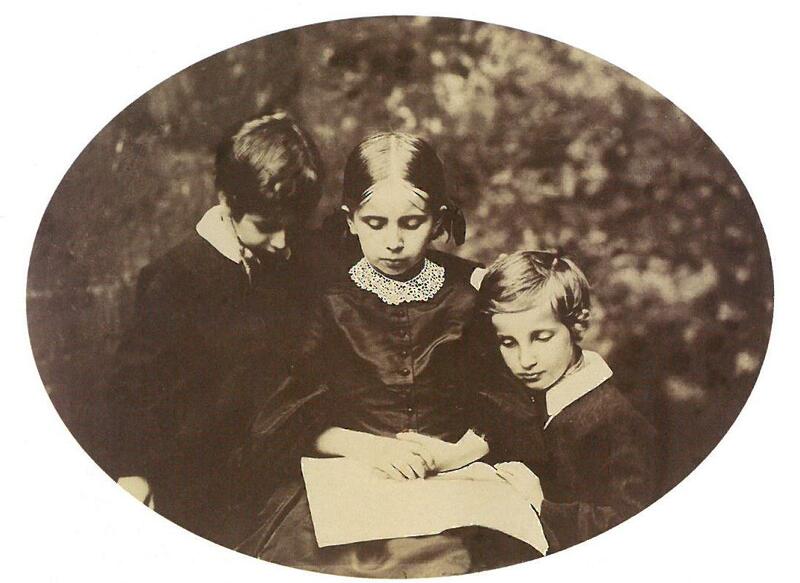 When Sarah Angelina Acland (Or 'Angie' as she preferred) was 7 years old, she and her brothers sat for an Oxford photographer named Charles Lutwidge Dodgson. 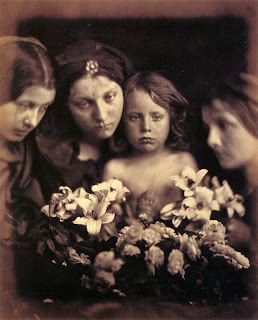 They missed out on being his first group of children photographed, that honour going to their friends the Liddell girls. They were the children of Henry Wentworth Acland, Regius Professor of Medicine, and lived among the artistic and famous in Oxford. 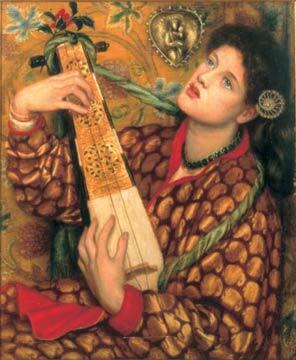 Miss Acland remembered Rossetti and gang painting the murals in the Union and occasionally giving her his palette. 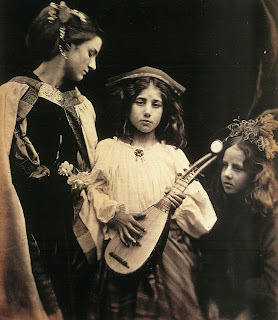 Ruskin stayed with them in their home and it was when Julia Margaret Cameron was paying visit to him that Miss Acland met the woman who would influence her later career. 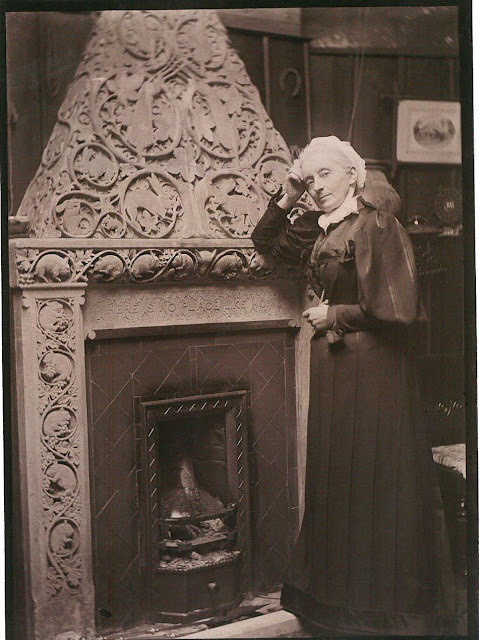 Ruskin did not admire Mrs Cameron's work and Miss Acland remembered Julia exclaiming 'John Ruskin, you are not worthy of photographs!' When Sarah Acland took up photography she at least managed something that Julia did not, photographing Ruskin. 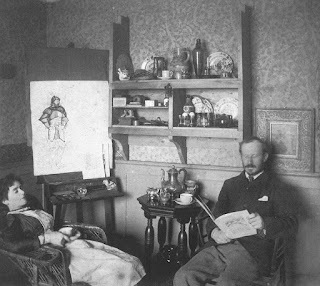 Miss Acland's interest in art resulted in her parents encouraging her to take lessons from Ruskin to whom she grew very close. In 1870, their relationship became such a concern to her parents that he was moved out by her father, but she continued to see him and became for all intents and purpose his secretary. Photography in Oxford was a growing occupation with its implication in science, art appreciation, and travel. Angie's father assembled an album of photographs at home and offered encouragement to the upcoming photographers in their circle, including Charles Dodgson. Mary Agnes Hope was Miss Acland's god-daughter and one of her most frequent sitters. 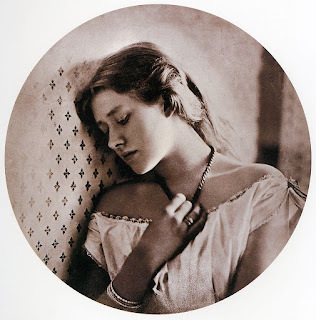 In a photograph that reminds me very much of George Charles Beresford's image of Virginia Woolf from almost a decade later, it is obvious that taking a 'likeness' of Miss Hope is not the primary reason for the photograph. The elegance of her profile, the interesting detail on the back of her blouse have more attention than what she looks like. Mrs Peard, a naval widow and her daughter were photographed while Miss Acland was overwintering in Devon. 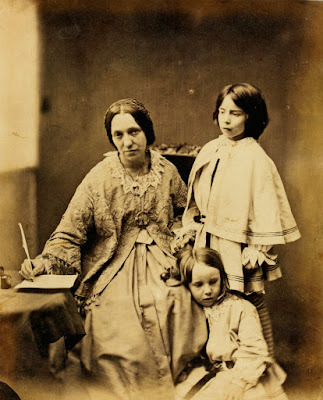 Frances Mary Peard was a novelist, author of 15 books and is presumably posed reading one, but I love the vaguely cheeky expression on her mother's face that shows marvellous spirit in the 88 year old's face. 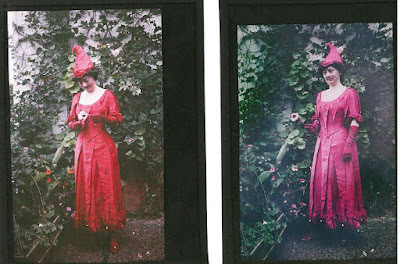 The invention of the Autochrome process in 1907 that sealed Sarah Angelina Acland's reputation as a pioneer. By this point, she had already given four lectures on colour photography but with the advent of Autochrome things became a lot simpler. If I understand it, instead of having three separate plates to combine and make the colour, you stain potato starch the three colours and spread them over the glass plate in turn, then add your emulsion (which in this case is panchromatic). 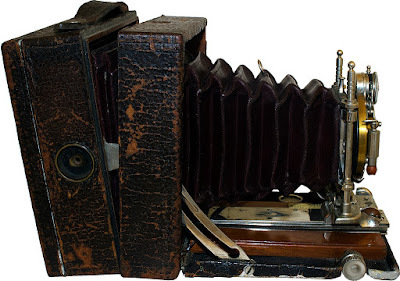 When you put your glass plate in the camera, instead of facing the emulsion to the lens (like I did with wet collodion), you turn the glass plate so that the image will pass through your coloured potato starch layers before getting 'stuck' on the sensitive emulsion. Ta da! I think that the marvellous thing about Autochrome is that the image is made out of tiny points of intense colour, so things like the red of the geraniums really hit you. A Portrait Outdoors shows Miss Acland's goddaughter Mary Agnes Brinton (nee Hope) on the steps of Clevedon House, Oxford. 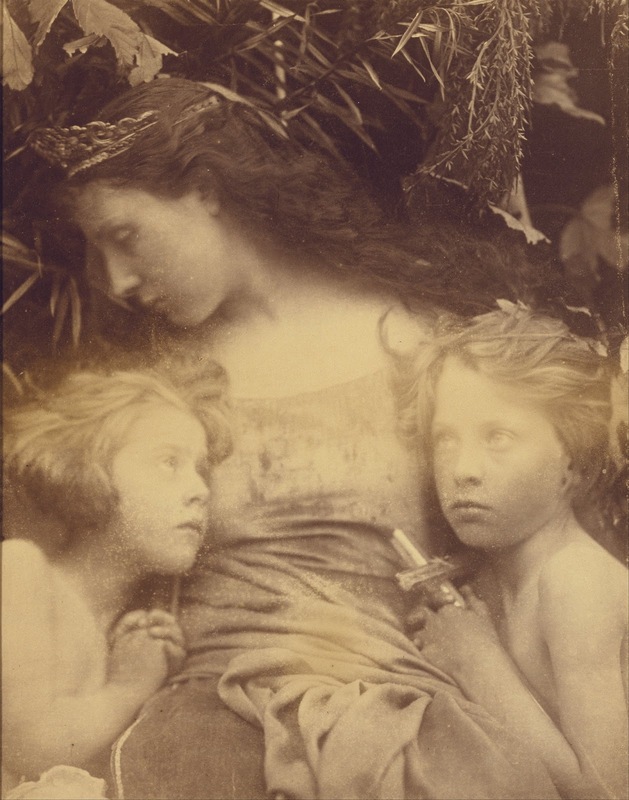 The image was awarded the red rosette (on the top left hand corner) in the 1908 Oxford Camera Club exhibition. These two plates are the earliest colour pictures of John Everett Millais' infamous portrait of Ruskin, hanging in Miss Acland's house in Oxford c.1913-17. The left is the spoiled plate where the green dye had spread and affected the finished colour balance. On the right is a digital restoration to show how it should look. The picture above the Ruskin portrait, by the way, is We Are Seven by Elizabeth Siddal. 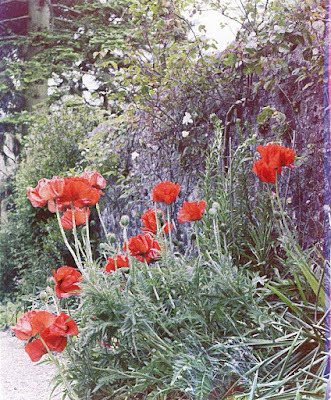 The above pictures were taken in Gibraltar where Miss Acland stayed with her brother, William, who was Admiral Superintendent of the Gibraltar dockyard. 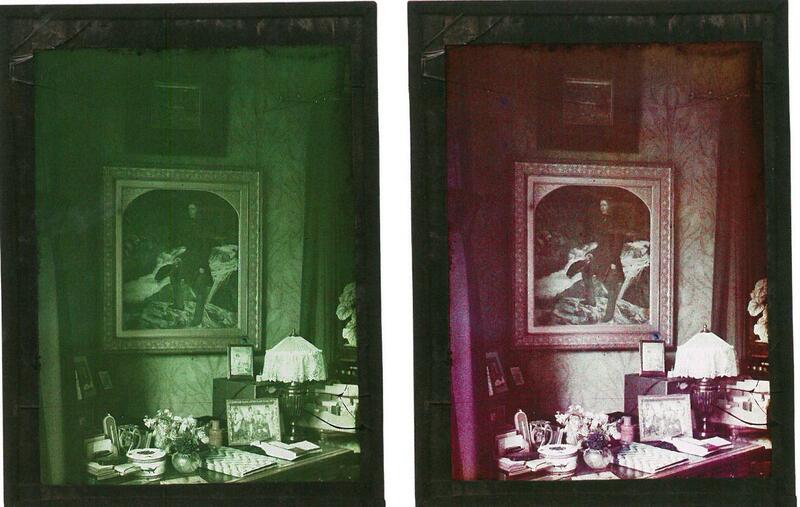 The picture on the left is an Autochrome whilst the right is a Dufay Dioptichrome plate, an attempt to make colours more 'true' and less extreme, by passing the light through a geometric filter screen which was finer and sometimes separate from the plate. The difference is marked as the colour in the Autochrome plate is more vibrant, especially the red/green contrast. 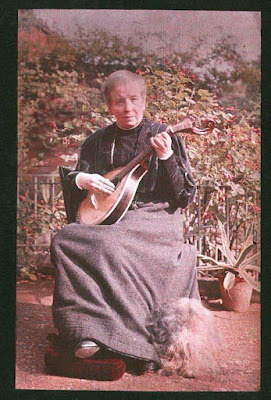 This is a self portrait of Sarah Angelina Acland and the blur at her feet is her dog, Chum, taken in the garden of her home in Oxford. 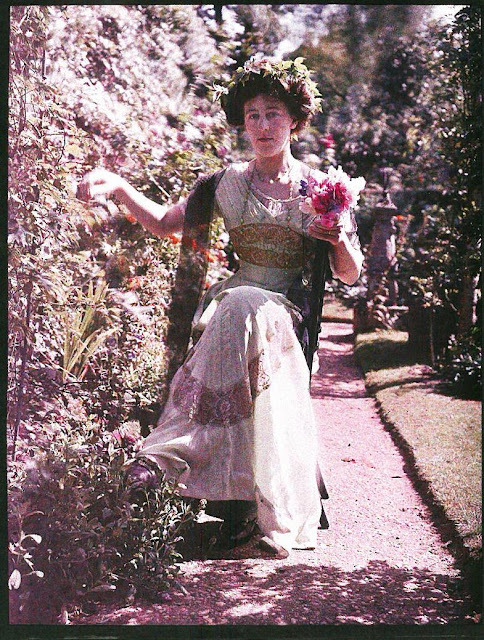 The Autochrome process required a long exposure time which means Chum becomes a fluffy blur. 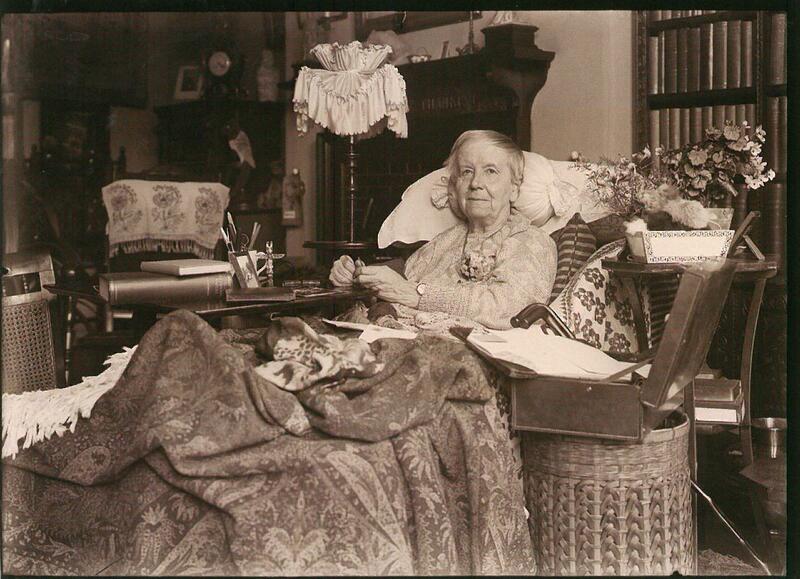 This is the last known self portrait of Miss Acland, taken two years before her death, in her Oxford home. At her death, notices appeared in the British Journal of Photography and The Times praising her use of colour and her excellent skills in portraiture. 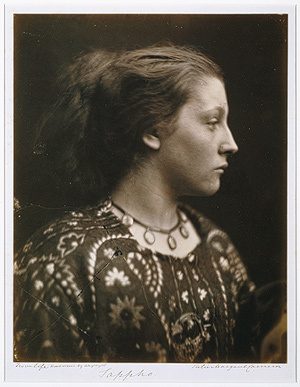 Her collection of negatives, prints and transparencies were eventually bequeathed to the Bodleian Library and her equipment to the Museum of the History of Science, where in the 1980s the collection was reconciled. 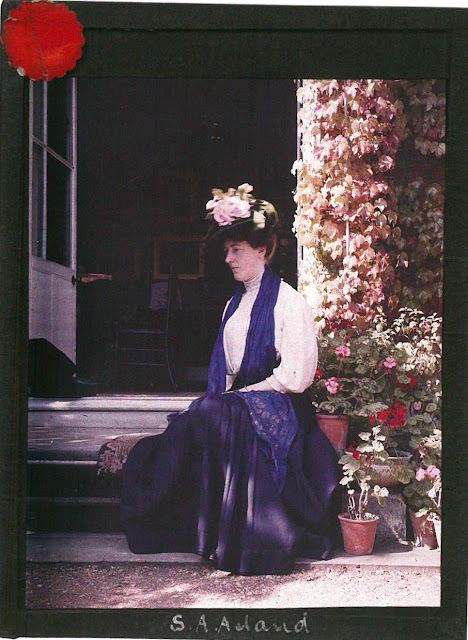 The most beautiful catalogue of her work, written by Giles Hudson is where I got the above pictures and information from. I cannot recommend it enough and it can be purchased from here (UK) and here (USA) and at a second hand bookshop of your choice, no doubt. I thoroughly recommend it. 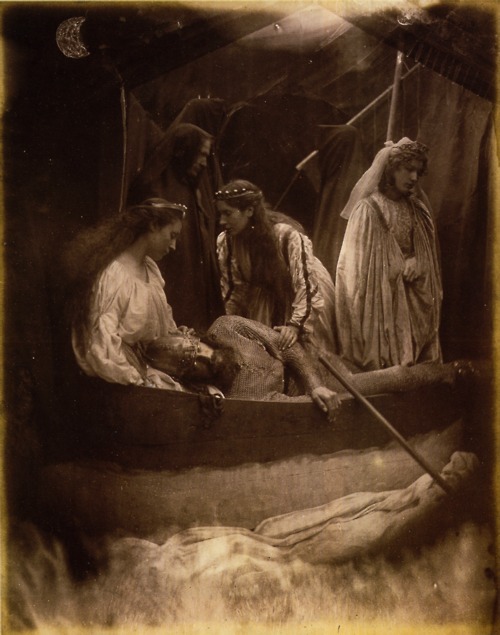 It would be lovely if, on this 200th Anniversary of Julia Margaret Cameron's birth we can also raise the profile of another pioneer of the photographic arts who derived so much inspiration from her. Anyway, imagine my delight when I was sent a review copy of Arts and Crafts Stained Glass by Peter Cormack. 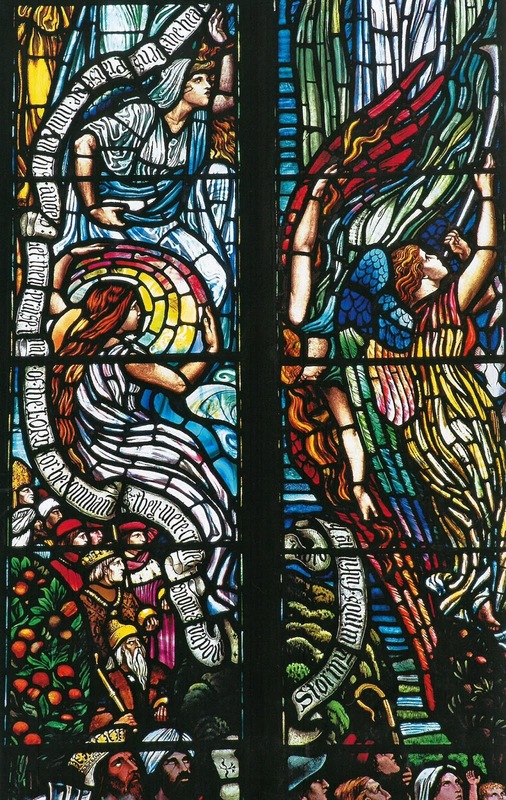 This massive, glossy tome of 354 pages long is richly illustrated in colour and contains enough windows to keep me quiet for many an hour, together with the fascinating history of how the Arts and Crafts Movement transformed the look and production of stained glass, religious and secular, in both Britain and America. This book is the culmination of 30 years worth of research into the subject and aims to show how the Arts and Crafts Movement of the 1880s and 90s was progressive in its reinvention of stained-glass as a modern, progressive art form. It's a book about personalities as much as it is a book about art, with the figure of Christopher Whall looming large as charismatic teacher and producer of exciting panels. 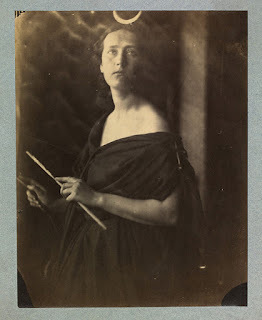 Much like Julia Margaret Cameron and her chicken house studio, Whall set up his studio in a stable (or 'cow-house' as he referred to it), working alongside Polly the cow and a host of chickens. 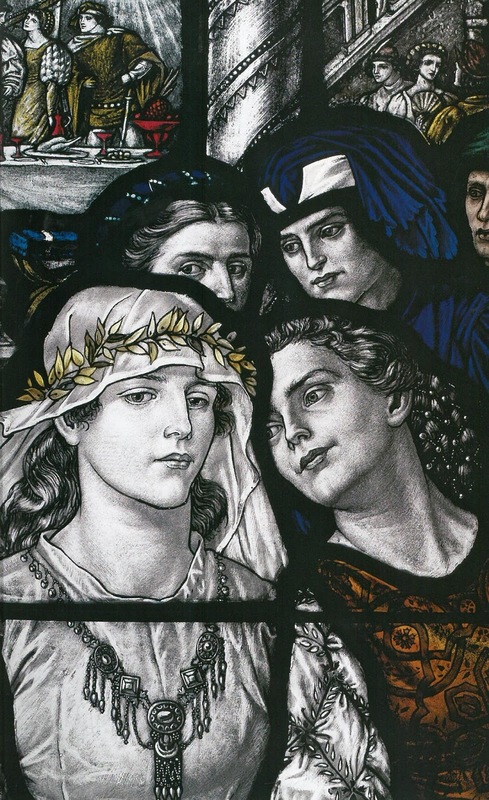 Beginning with William Morris, Edward Burne-Jones and other figures of the mid-Victorian art world, it is easy to see how their influence continued in the works of later pioneers. 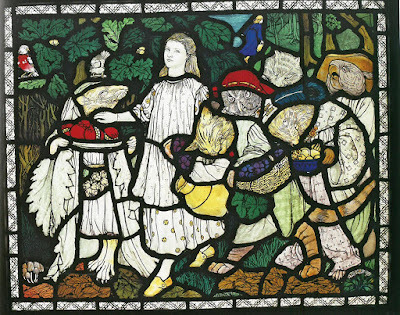 I found the different styles that quickly emerged in the glass work fascinating, levels of abstraction played with within the Arts and Crafts framework. 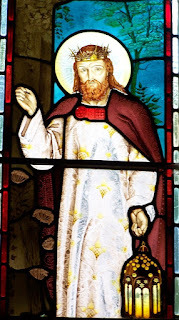 I particularly loved seeing the way that Morris' work was carried on in spirit and style so that it is possible to see his hand in mid-twentieth century memorials as well as very straight-forward tributes to the man himself. 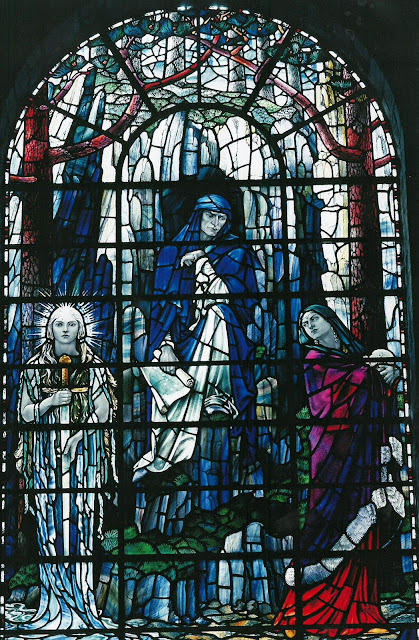 All the windows are beautifully photographed, some in detail, others in their full glory, and you will see both familiar and lesser-known pieces in the book. It was wonderful to see the Goblin Market panel and the Morris window which I would not get to see in normal life (especially if they are on the other side of the Atlantic), as well as having the church windows referenced so that you can go and visit them and see them for yourself. 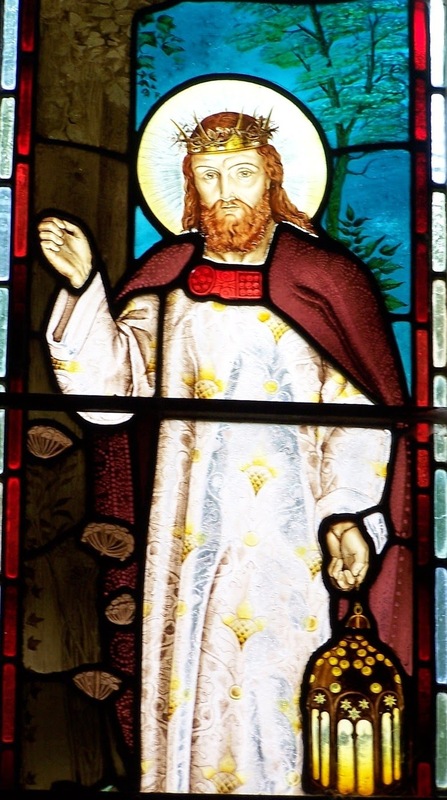 I also enjoyed seeing both secular and religious stained-glass, as it is a practice that we tend to think of as being religious (and therefore possibly not as mainstream and popular as it would have been at its creation). With pieces that date from before the First World War, it is arguable whether the religious and the mainstream were not one and the same. 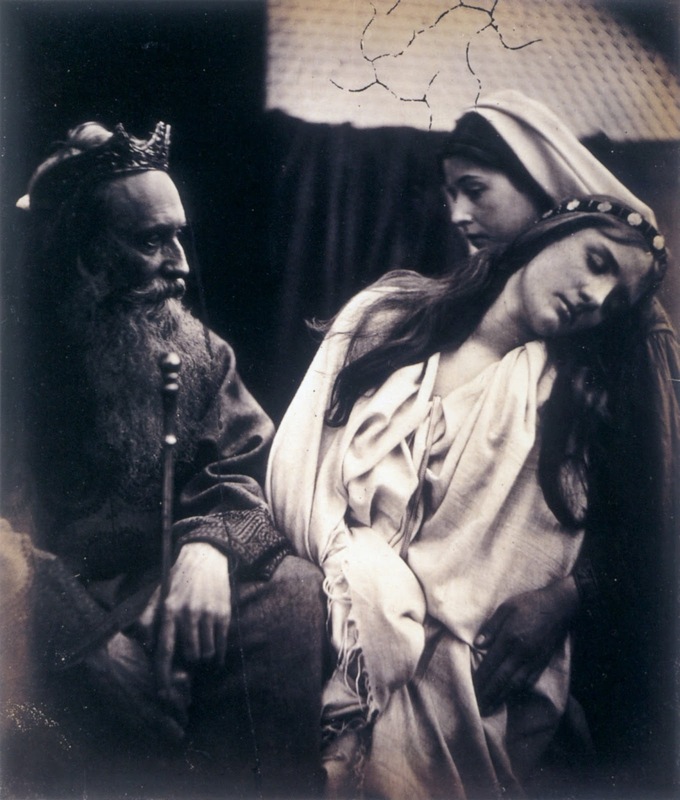 Certainly artists working on overtly religious subjects one day then something like Babes in the Wood or Goblin Market the next probably did not see such a contrast as modern eyes do. There is a tension in the religious aspect of the works in this book possibly putting people off but they are of such absolute beauty that whether you believe or not, they are wonderful pieces of art. The claim that women were able to find a parity in the movement is an interesting one and the argument put forward is very persuasive but as stained glass is quite an anonymous craft, I wonder if that is what helped their cause. It is only with scholarship such as this book that we can appreciate how many women made their contribution to the movement and appreciate the depth of their involvement. Either way, this is a wonderful book that is perfect to flick through or read at length, depending on how much information you want. It's not cheap, but it is hard to imagine a more perfect or comprehensive overview of such an overlooked aspect of Victorian art. 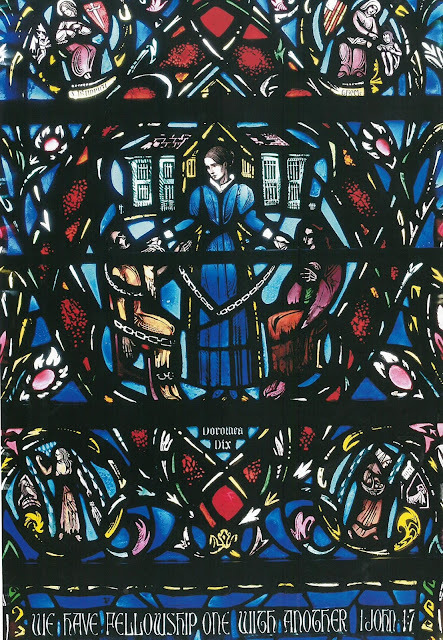 Arts & Crafts Stained Glass by Peter Cormack is out on 7 July and is available here (Amazon UK) and here (USA) or at a bookshop near you! 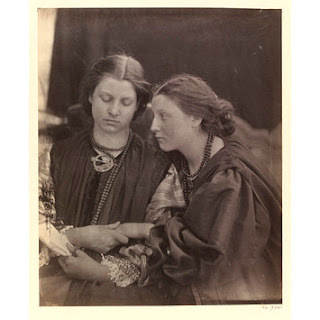 As we saw from the previous post, the way that Julia Margaret Cameron chose to dress her subjects ranged from the simplicity of swathes of white or black robes to elaborate patterned dresses, and this approach also extended to her use of jewellery. 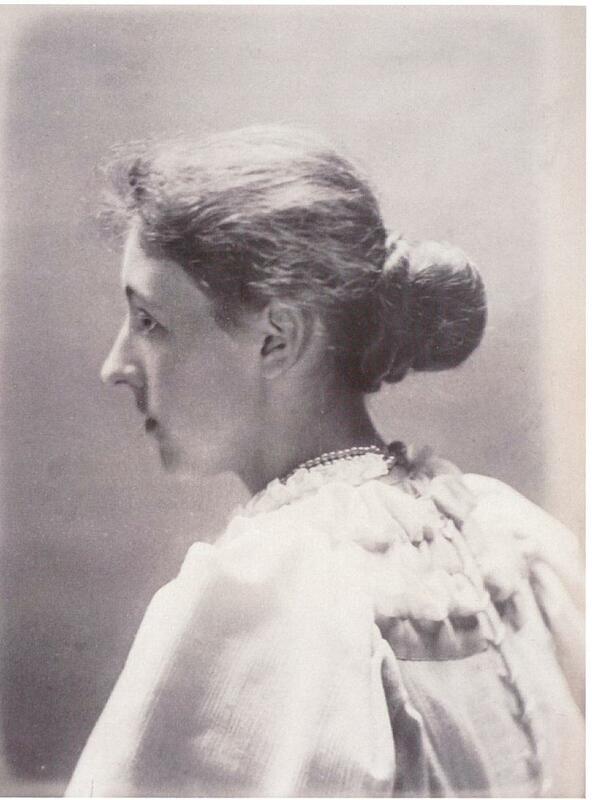 In her collection, Julia held pieces in Indian silver, crowns, and Celtic brooches and clasps that decorated the shoulder, chests, heads, and necks of the women in her art. 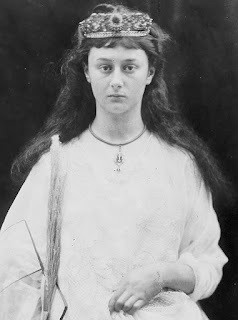 Starting with Julia's own image again, I was struck by her penannular brooch, a beautiful mock-Celtic 'Tara' style fastening. These became popular in the mid-nineteenth century when the Celtic Revival took inspiration from the pins displayed at the Great Industrial Exhibition in Dublin in 1853. Before long, cheaper Indian silver replicas were available at a fraction of the amount charged by Irish craftsmen. 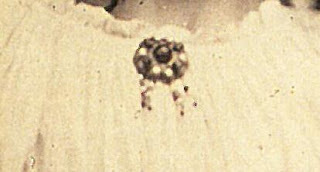 It is apparent that Julia owned a couple if not more of these Celtic-style brooches and used them to pin the drapery in her photographs. 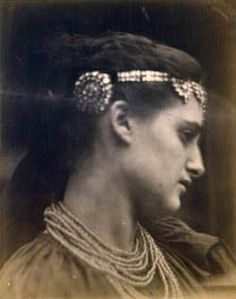 The Celtic-style brooch was not the only type displayed; Kate Keown, in the centre of The Minstrels group, wore a round brooch which reminds me of a piece designed by William Morris. 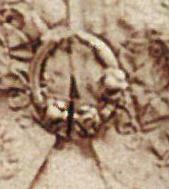 The shield brooch appears again in Mignon, a picture taken at the same session as the above image. 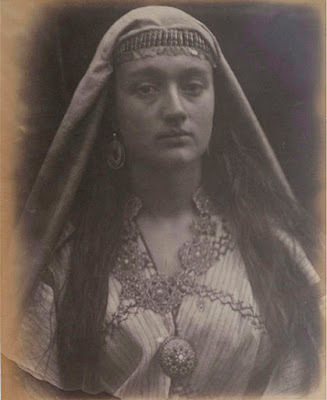 Both penannular and shield brooches are very distinctive and their positioning in the centre of the garment makes them easy to recognise and act as shorthand for past ages as well as current fashion. 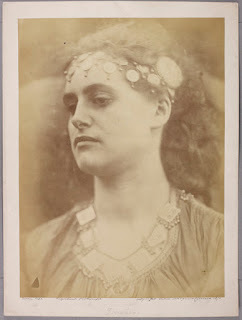 It is possible to 'chase' items of jewellery from one image to another. In the case of the headband in Balaustion, it occurs again as a necklace in Hark! Hark! Often linked with Dante Gabriel Rossetti's works such as A Christmas Carol (left) or Joli Coeur, And Enid Sang uses the familiar template of a beautiful, loose-haired woman playing an instrument, the hearts on her jewellery showing the world her love. 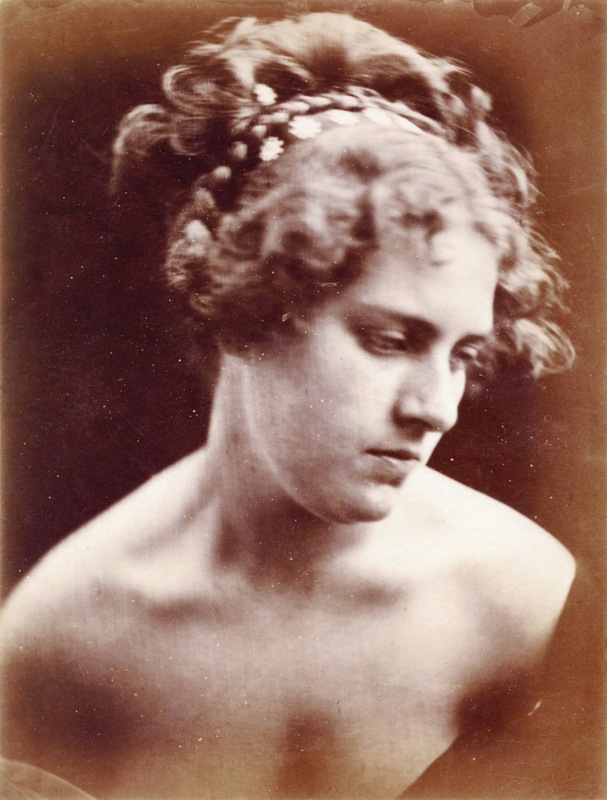 Emily Peacock as Enid plays the part of the Tennysonian heroine, lover of the knight Geraint. The look of melancholy seems to contradict the hearts around her neck but reflects the sorrow that Enid suffered in her loyalty to her beloved Geraint, a passive victim of both Fortune (as expressed in her song) and her husband's jealousy. Still through it all she has enough love to see her through, as expressed by the many shiny hearts around her necklace. Ellen is shown in this wedding portrait, holding the scented violets in her hand while sniffing the showy, unscented camellias. Over the top of her wedding dress's lace collar is a string of beads, possibly the same ones she wears in Sadness. 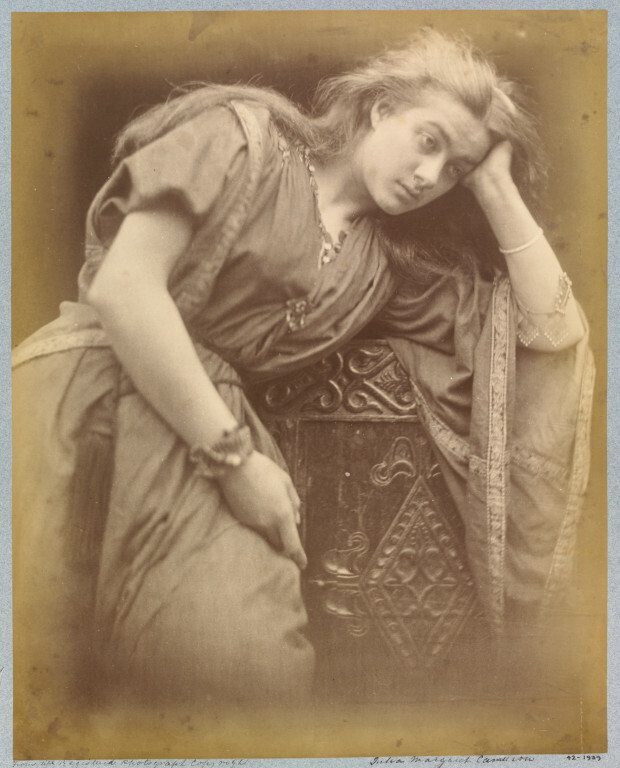 I also think the bangles she wears in both picture are the same, possibly linking the notion of sorrow to her marriage, which would have been unfortunately apt. 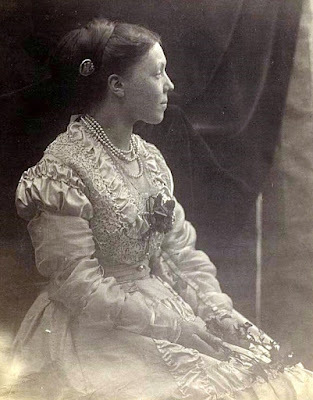 Moving up, Julia literally 'crowned' a lot of her subjects with coronets and jewels that glimmer among the tumbling hair. In both A Bacchante and Vectis, Cyllena Wilson wears tiny pins in her hair, some in the shape of stars. Unusually, these are the only jewellery worn in both images, making them stand out of the otherwise unadorned images, the stars especially striking in their beauty. Possibly the most amazing of the pieces of jewellery worn are the crowns and coronets that grace the heads of Julia's muses. These range from simple bands to more elaborate, jewel-encrusted pieces. Henry Taylor wears a pointed crown and Mary Ryan has a jewelled band that can also be seen on Mary Hillier's head in her portrait of 1864-65. Taylor can be seen in his pointy crown as King David as well. That is probably the biggest of Julia's crowns, making Mary look majestic and formal rather than the rounded maternal figure she normally portrayed. 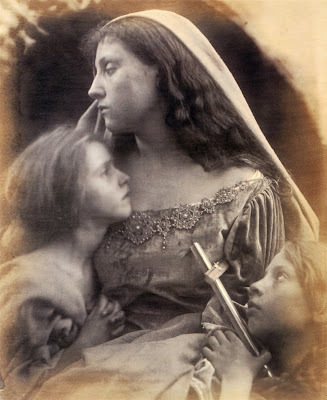 It isn't Mary's only crown moment though, she also wears a jewel-set curved one in The Holy Family, possibly the same one worn by Alice Liddell in St Agnes. I find the differences in costume between the men and women in Julia's work very interesting and crowns are a good measure of her attitudes towards both. 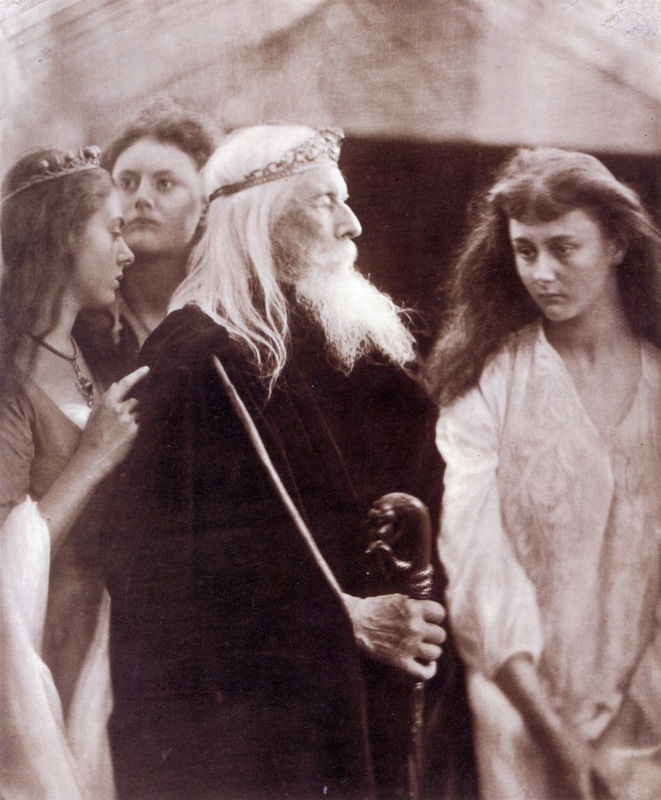 Possibly the difference in age between the majority of her male and female sitters can be seen as an indication of how she saw ideal male/female dynamic - the men, like her husband, older and wiser, the women young and patient, knowing their place (the exception being Vivien and Merlin, obviously). 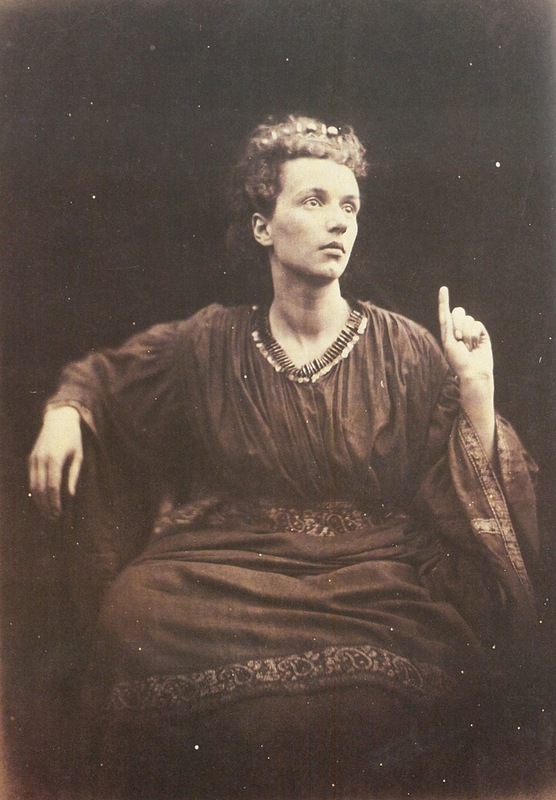 Queen Philipa is a very obvious example of the dynamic. 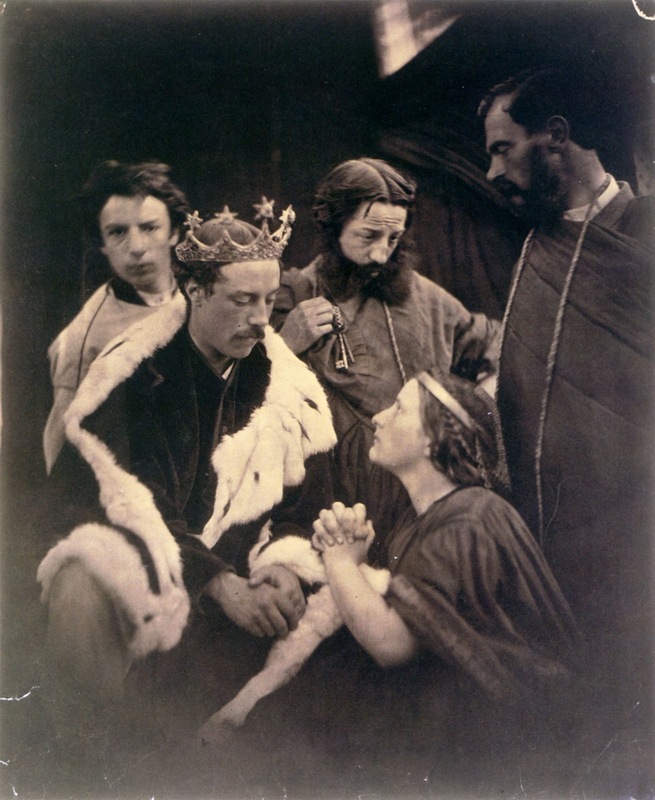 The noble queen, wearing a thin band of a crown, pleads for justice for the people of Calais and the burghers who have come to broker peace. 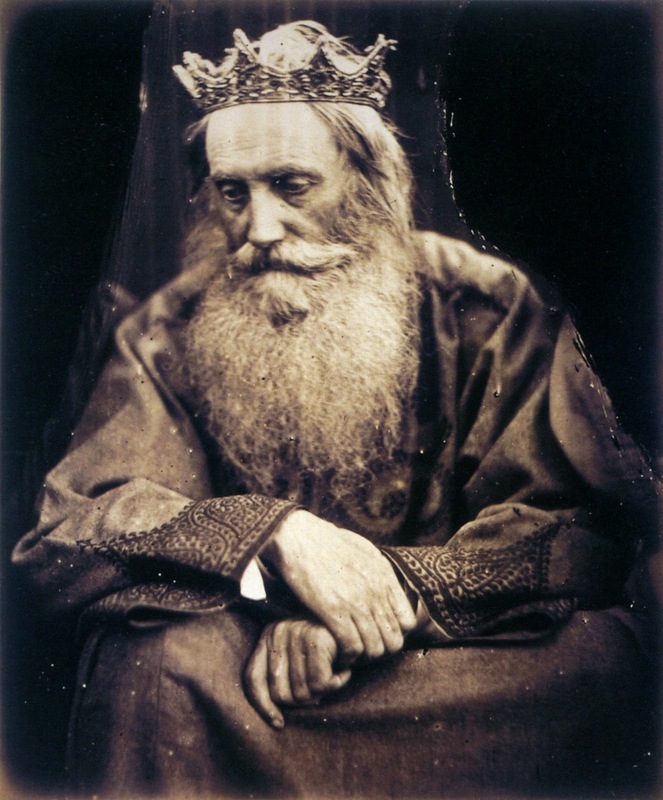 King Edward, wearing the same crown as King David above but with stars attached, listens to the wise counsel of his young wife. 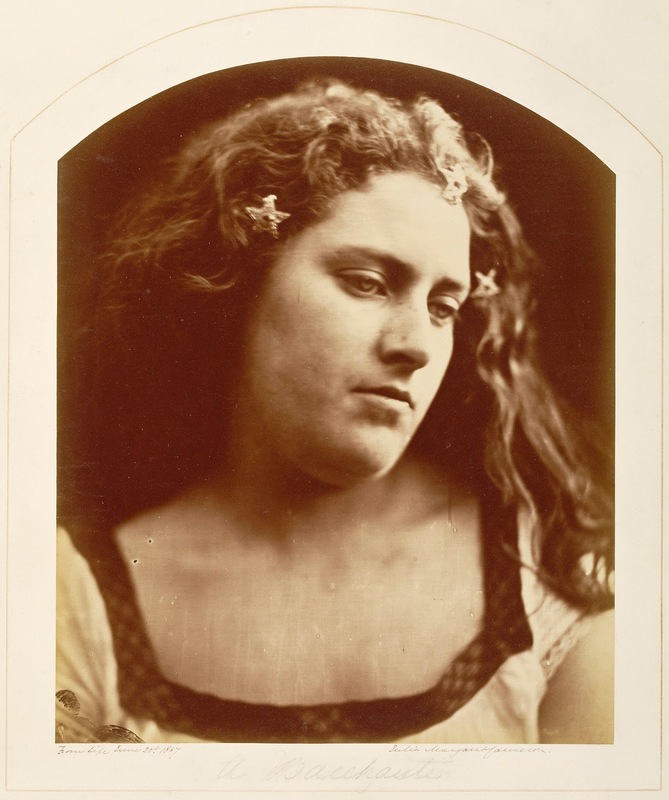 In marrying a much older man herself, possibly this is how Julia saw the ideal, although it can hardly be said that the marvellously bossy photographer fits the type of one of her patient, passive women. I have really enjoyed searching through Julia's photographs, matching the garments and jewellery of her costumes. 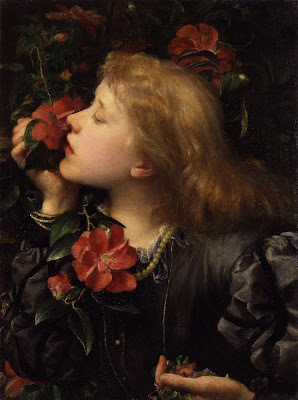 Through her use of ornamentation, Julia shares Rossetti's vision of ornamented women, garlanded with jewels, making their bodies decorative surfaces to add meaning to the whole. Something in the ingenious placing of pieces, necklaces to headdresses for example, promotes the exotic in her work, reflecting that part of her art which was forever rooted in the colonies, away from a traditional Victorian aesthetic. It is this part that shows us her vision of making a fantasy land in the back garden of a house in Freshwater. 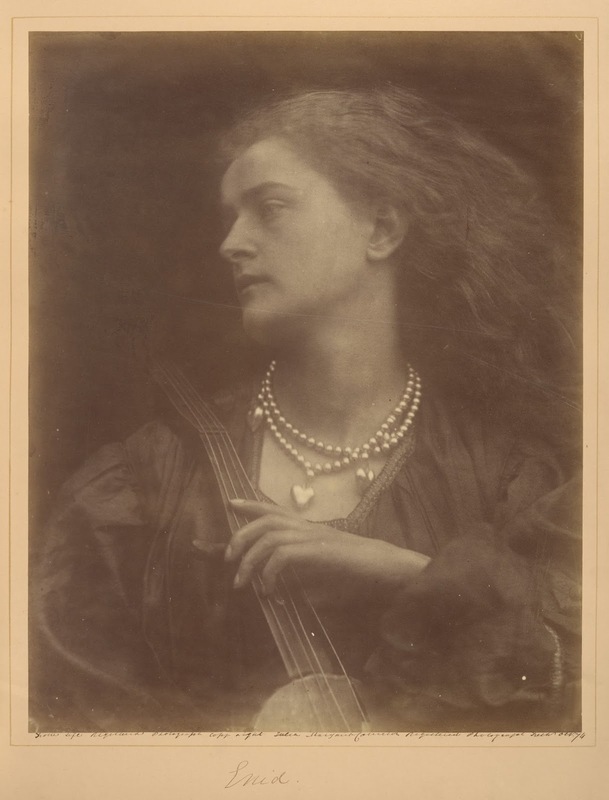 Happy birthday, Julia Margaret Cameron!